PHOTO BY MARK CHAMBERLIN A pork-loin sandwich from Baked and Carved, located inside Salinger's on East Ave.
PHOTO BY MARK CHAMBERLIN Baked wings from Baked and Carved. 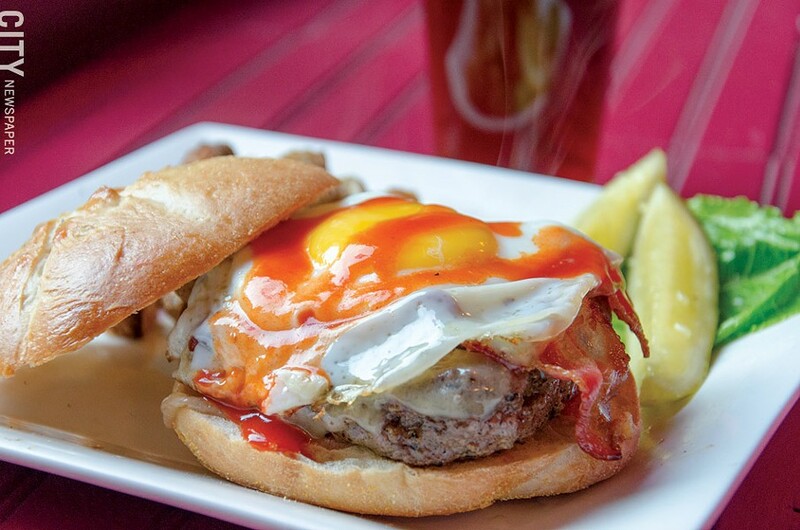 PHOTO BY MARK CHAMBERLIN A burger with fried egg from Baked and Carved. Baked and CarvedInside Salinger's, 107 East Ave.454-7103, bakedandcarved.comOpens Monday-Friday at 11 a.m.,Saturday at 5 p.m. 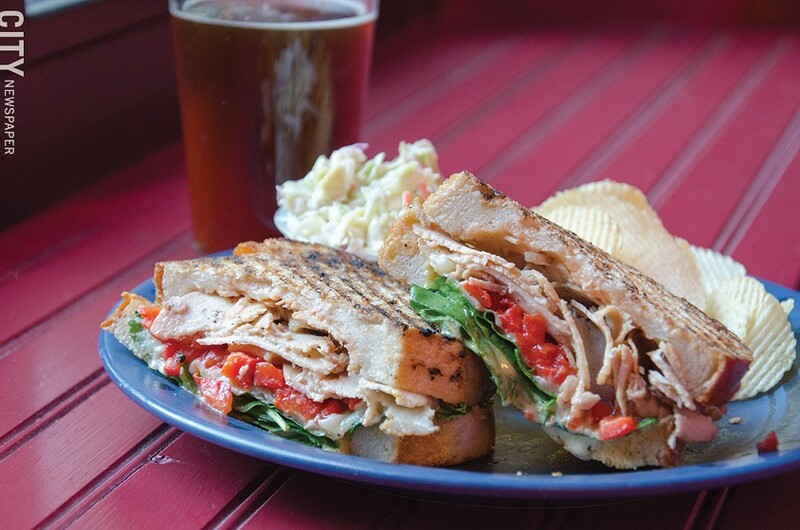 There are few things better than a really good sandwich. Haute cuisine and molecular gastronomy are all well and good, and sushi and ceviche surely have their proper place and time. But on a cold day in January, there are few things more satisfying to the soul than a well-composed sandwich and a bowl of steaming soup. That said, our town doesn't enjoy an overabundance of great sandwich shops, and the good ones that have opened have tended not to last or, sadly, to fail of their initial promise. Two places in close proximity to the Federal Building on State Street succumbed last year. Others have come and gone. And through it all a tiny sandwich shop tucked into the back of an East Avenue bar has slowly gained a following among those in search of a fast, hearty lunch. Originally opened by the owner of the late O'Bagelo's and Jim Panzerella, owner of Salinger's, Baked and Carved is a bit more than two years old and seems to be positioning itself for a long run in its slightly covert location. The only sign that there's a restaurant hidden inside Salinger's is a hand-lettered chalkboard outside the door, and on two of my three visits it was mostly hidden by a snow bank. Find your way into the restaurant, though, and you are in for a real treat. As your eyes adjust to the dimness inside (it is a bar, after all) your nostrils will flare, catching the aroma of roasting meat — some days it's turkey, some pork loin, even roast beef. If you weren't particularly hungry before you came in, you will be by the time you reach the counter and have to actually order rather than simply staring about hungrily sniffing the air. The menu at Baked and Carved is evolving under the supervision of the restaurant's new manager, Jessica Porteus. She's making what she described as "small changes" with a view toward making her "small place grow big." Chief among those is her insistence that everything should be homemade. She makes her own breads, roasts her own meats, and concocts her various soups from scratch. She even rolls out dough and makes a pretty good pizza that she sells by the slice to the bar crowd. The folks who drop in for lunch are looking for sandwiches for the most part, though, and while the menu is concise, it's not skimpy, offering something for even the pickiest of eaters. I usually try to stick to the published menu at restaurants, thinking that it's unfair to review something that my readers won't be able to try for themselves. At Baked and Carved I abandoned the practice, in part because the specials menu is a testing ground for Porteus' newest ideas, like the inspired combination of thinly sliced roast pork, provolone, roasted red peppers, and spinach slathered with a garlicky mayonnaise on Sicilian bread that I had on my first visit. I don't even recall ordering the sandwich, and chances are good that I didn't have much input into the process: Porteus is not shy about telling her customers what they want. For those who find decisions difficult she will gladly take matters into her own hands. That's how I came to have that pork sandwich, and I'm glad that it worked out that way. The meat was tender, juicy, and nicely porky, the sauce added just the right blast of garlic and mustard. The bowl of corn chowder — again I wasn't aware that I ordered it, but it was a good choice — was full of corn and bits of chicken suspended in a broth that was probably 9/10 cream. It made a nice dip for the tiny bits of crust that were all that remained of my sandwich after a few minutes of ravenous gnawing. Porteus' take on a Reuben was similarly good, if not at all traditional. Corned beef and sauerkraut are key players, and there's Swiss cheese, but the bread is a thinly sliced Italian rather than rye, and it's pressed like a panini rather than grilled. The results are tasty, even superb — an illustration that sometimes you can play fast and loose with a recipe and have things come out OK.
For those looking for more pub-ish food, Baked and Carved also offers wings and burgers, the former better than the latter. 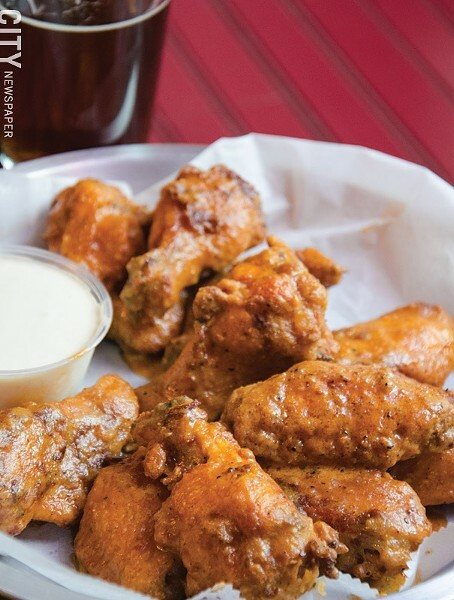 Porteus doesn't have a fryer, so her wings are slow roasted, concentrating their flavors and absorbing sauce rather than just being tossed in it at the end of the process. Meaty, spicy, and a bit addictive, I found myself wishing the bar opened earlier so that I could have a beer with them. The burger was less exciting. Good meat cooked to a nice medium rare, topped with judicious quantities of bacon and cheddar cheese as well as a fried egg and a dash of hot sauce, it had the potential for greatness, but it was entirely lost inside a bun that would satisfy your USDA grain requirement for a week — a problem endemic to our area, and one that marred an otherwise promising burger. Porteus assured me that she's working on that, too, and I have every confidence that it will be even better next time.